Summary of today’s show: Fr. Robert O’Grady discusses with Scot and Fr. Chris yesterday’s appointment of Bishop Peter Libasci as the 10th bishop of the Diocese of Manchester and then they talk about just how a priest or bishop’s name ends up on the Pope’s desk for appointment to the high office in the Church and just what role the bishop plays in the life of the Church. 1st segment: Scot welcomed Fr. Chris. He went tomato picking this weekend in New Hampshire with many of the parishioners from Sacred Heart Parish in East Boston, who were mainly Italian. They brought 160 pounds of tomatoes back with them. It was a great experience for a city kid. These tomatoes will be canned and will last until next September. He also attended the ordination of 13 permanent deacons for the archdiocese at the cathedral. He was impressed by the number of priests who came to show how they’ve already established great relationships with the priests of the archdiocese. Cardinal Sean joked that there’s nothing worse than a high maintenance deacon. He also reminded them that when their wives die, they will remain celibate for the rest of their lives so he told them to take very, very good care of their wives. The new deacons are David A. Brooks, Christopher Z. Connelly, Paul David Coughlin, Joseph Bryère Guerrier, Geoffrey W. Higgins, Joseph J. Hopgood, Cheonil Kim, Paul Michael Kline, Howard C. League, Vincent James Leo, Timothy John Maher, Thomas L.P. O’Donnell, Jr., and Kevin J. Winn. Scot said his mom attended the first Mass for one of the deacons at her parish in Lowell. Fr. Chris said that the 13 men have gone to 13 very different parishes throughout the Archdiocese and are already involved in very good work. Today, on the show, Fr. 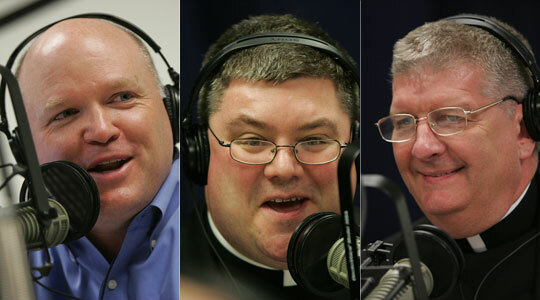 Robert O’Grady will talk with Scot and Fr. Chris about the process of appointing new bishops, especially the appointment yesterday of Bishop Peter Libasci for Manchester, New Hampshire. His installation Mass will be on December 8. 2nd segment: Scot welcomed Fr. O’Grady to the show. Scot said bishops’ appointments are announced at noon Rome time, which is 6am here. Bishop Libasci was auxiliary bishop in the Diocese of Rockville Centre, New York, in Long Island. He was a priest for his whole career, a parochial vicar and pastor. He said he was surpsied to be named bishop the first time. He’s very low-key and humble and self-effacing. He’s also biritual, which means that he has permission to celebrate the Liturgy in the Ruthenian Byzantine rite of the Catholic Church as well as the Latin-rite. He’s also been the vicar of the eastern region of Long Island, which includes the Hamptons and the North Fork, the wealthiest and toniest part of the Long Island. However, Bishop Libasci said the area includes many blue-collar towns and Indian reservations, so it’s not just the rich and powerful. Someone noted he had twice as many people in his region as he will have in his new diocese. Bishop Libasci is the 10th bishop of Manchester. He was introduced by his predecessor Bishop McCormack. Scot said it’s good to know that Bishop McCormack hasn’t lost his Boston accent after 13 years in New Hampshire and the Long Island accent of Bishop Libasci will take some getting used to. Scot said he likes the passion he heard in his first reactions as he drove up to his new home. Scot said you can’t help but be impressed by the beauty of New Hampshire as God’s country. But also the description of the mills as a place where people spent so many of their lives, seeking a better life for their families. Fr. Chris said he captured both sides of New Hampshires, places of work where so many Catholic supported their families and the natural beauty. You can tell it will be an important part of his ministry to ensure that the faith continues to pass on. Fr. Bob said they also have St. Anselm’s College, a top Catholic college, and Dartmouth, one of the Ivy League, which brings great variety to the diocese, which he wouldn’t have had on eastern Long Island. Manchester has 90 full parishes as well as missions, totally 126 worship sites. There are 86 active diocesan priests. Also many religious, including the Benedictines of St. Anselm. The total Catholic population is about 300,000 Catholics. When in 2007, I was told that I was chosen to be an Auxiliary Bishop for the Diocese of Rockville Centre, I was overwhelmed at the thought that anyone knew that I even existed. And now, four years later, I have been called, yet again, but now to be the Bishop and Shepherd of the Church, the Household of Faith in, what will be for me a new home, a new family, a new beginning in Grace. Fr. Chris said this is the first chance the people of New Hampshire to encounter their new shepherd. He also noted that the bishop quoted the Baltimore Catechism on why God created us. He made a clear point that the tradition of our faith needs to be passed on by parishes and families. After his prepared remarks, Bishop Libasci took some questions from the local press. (See the video above) He started by responding to the challenges he sees as the bishop of Manchester. He said his first challenge is to listen and learn. Scot said that it’s remarkable humility. By hearing he will come to know what the Catholic community sees as their challenges. Fr. O’Grady said a bishop usually gives a new pastor the advice to not make any big changes for a year. Bishop Libasci is saying the same thing; he has to learn what it is he’s inheriting, what he has responsibility for. Scot said the parishioners need to know that he loves them, that he knows them, before they will follow his lead. The great leaders are those who people want to follow and who they trust. Fr. Chris said he’s also echoing Lumen Gentium from Vatican II where bishops are told to consult with the laity to know their needs and concerns and the laity need to let the bishop know their needs and concerns. He was also asked at the press conference how he plans to continue the healing process from the sexual abuse crisis. Scot said he takes away from his response that Bishop Libasci cares for all those affected, not just the victims, but also the innocent priests and the people in the pews. Fr. Chris said you could hear compassion in his voice and a desire not to run from the question. He said, Together, we will work through this. Fr. Chris said you can’t have extraordinary expectations right off the bat. Fr. O’Grady said he noticed that after the press conference he went to a Catholic high school, a food bank, and a convent of religious sisters, then a dinner with priests of the diocese. He went to get a flavor of the diocese right away. 3rd segment: Scot said the appointment of bishops is a long process. It starts with the surfacing of names. There are ecclesiastical provinces throughout the country. There will be one metropolitan archdiocese, which here is Boston, and then suffragan dioceses, which in New England are Portland, Manchester, Burlington, Bridgeport, Hartford, Fall River, Springfield, Worcester, and Providence. Once per year the bishops meet to discuss priests who would be worthy bishops. Before that bishops can consult within their diocese for those names. By canon law, they are required to do that one on one with others, not in group meetings, in order to maintain confidentiality and so that those whose names are considered and not appointed aren’t embarrassed by that. Fr. O’Grady said a bishop told him that it was amazing how the names which were submitted individually seemed to come up so often. At the provincial meeting, there is a secret and confidential discussion of the names as well as which offices they’d be good at, like diocesan bishop or auxiliary bishop. An auxiliary might have a particular language gift or a talent in a particular ministry. So often it’s a need that motivates. In a diocesan bishops’ case, they agree on a list of three names, called a terna, which is sent to the nuncio in Washington, DC, who modifies the lists or submits as is to the Congregation of Bishops, which does the same, and then it goes to the Pope who can select from the list or choose someone else. Fr. Chris said that with the death of Archbishop Pietro Sambi, the nuncio in the US, who died this past summer, the work of selecting names would generally stop. Scot said the work in the particular case of Manchester would have been completed at the nuncio’s level some time ago. Bishop McCormack had submitted his resignation 13 months ago which would have initiated the process. At each stage of the process, they consult with those who might know the priest, ask for feedback confidentially. The nuncio will sometimes consult with other bishops. Scot said that since Bishop Libasci wasn’t in our province, his name would not have been on the list sent from the provincial meeting. Fr. Chris said this a historic moment for New England because this is the first diocesan bishop Pope Benedict has picked here in New England. It shows what Pope Benedict is looking for here in this region. Pope Benedict has been appointing as bishops good parish priests who’ve stood the test of time, as opposed to say, seminary rectors or canon lawyers. Scot added they’re not just pastoral administrators, but good evangelizers who can truly lead. Scot said also consulted are previous bishops of the diocese being filled, the president of the bishops conference, and for archdioceses, all the bishops of the country. They also send out confidential questionnaires to 20 or 30 people who would know the prospective bishop. Fr. O’Grady said those who fill out the questionnaire aren’t even supposed to say they’ve seen it. It would include parish staffs who’ve worked with him, other priests who know him, and those work in the diocese. Scot said someone might know he’s a great priest, but they know he just wouldn’t be a great bishop for whatever reason. Scot said at every stage of the process there is a terna, a list of three names: from the province, from the nuncio, from the Congregation of Bishops. Fr. O’Grady said there’s a long tradition of the terna. He also said that the notion of the Holy Father appointing all the bishops of the world directly is only about 150 years old. Before that they were elected, like the Pope is now, and sometimes were selected by royalty. Fr. O’Grady said Bishop John Carroll, the first bishop in the US, was elected by the priests of the diocese, which included the whole US and was only about 12 or 13 priests. Fr. Chris said even today the Holy See does consult with governments before appointing bishops. Fr. O’Grady said Archbishop Timothy Broglio of the Military Archdiocese recently went to Argentina to visit with the administrator of the military archdiocese there. They haven’t been without a bishop for three or four years because the Argentine government has approval over the bishop for the military chaplaincy. He said when Cardinal O’Connell was made archbishop in Boston, in 1904 the bishops of the province sent a terna of three names to the nuncio, two bishops and a priest who were protégés of Archbishop Williams. But then Cardinal O’Connell was appointed instead. He noted that it shows why confidentiality is important because now everyone will question why O’Connell was appointed and the others weren’t. Scot said we talk about this because the bishops are the successors of the apostles and so much in a diocese occurs because a bishop says it’s so. Bad bishops can do tremendous harm to a diocese and good bishops can do tremendous good. Scot asked Fr. Chris to explain the three elements of the Office of Bishop. There is the teaching role. It is the bishops’ job to ensure the truths of the faith are passed on. Vatican II calls them conservators of the faith. They need to conserve the tradition. The second task is the sanctifying office. Priests are in a sense auxiliaries to the bishop. In the early Church, it was the bishop who administered all the sacraments and who knew the faithful by name. As the Church grew it became impossible for the bishop to do it all alone, but even today priests share in the ministry of their bishop. It is the sacraments that the bishop sanctifies the people and helps them to become holy. The third office is governance. As shepherd and head, it is the bishops’ job to ensure the Church runs well and is administered well. A part of that is the selection of pastors for parishes and those who will run agencies and ministries. The bishop ultimately makes the decisions yea or nay on the many missions of the diocese. Fr. O’Grady said in the Sacrament of Holy Orders, the bishop receives the fullness of Holy Orders. Priests are ordained twice, to diaconate and to priesthood. The bishop is The priest in the diocese and has the fullness of his office. Fr. O’Grady quoted Pope John Paul II who said you can’t do one of the three offices with the others: you can’t govern without teaching, you can’t sanctify without governing.